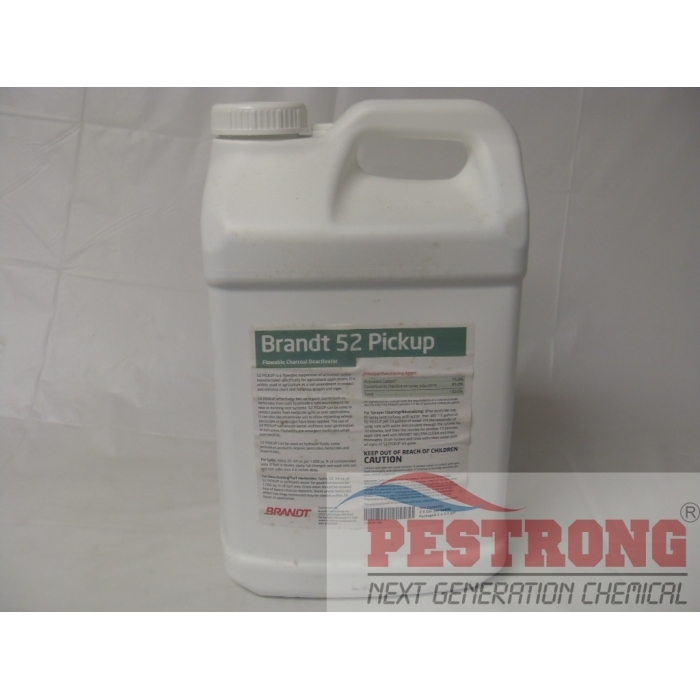 Where to Buy Brandt 52 Pickup, Brandt 52 Pickup Flowable Adjuvant Activated Charcoal - 2.5 Gallons - $94.95 for Sale with Fast Free Shipping! Brandt 52 Pickup Flowable Adjuvant Activated Charcoal - 2.5 Gallons is a flowable suspension of activated carbon manufactured specifically for agricultural applications. It is widely used in agriculture as a soil amendment to protect and enhance plant and turfgrass growth and vigor. 52 PICKUP effectively ties up organic toxins such as herbicides from soils to provide a safe environment for new or existing root systems. 52 PICKUP can be used to protect plants from herbicide spills or over applications. It can also decontaminate soil to allow replanting where pesticides or herbicides have been applied. The use of 52 PICKUP can ensure better and more even germination to turf areas treated by pre-emergent herbicides when overseeding. 52 PICKUP can be used on hydraulic fluids, some petroleum products, organic pesticides, herbicides and insecticides. For Spills: Apply 32- 64 oz. per 1,000 sq. ft. of contaminated area. If spill is severe, apply full strength and wash into soil and root zone area 4-6 inches deep. For Deactivating Turf Herbicides: Apply 32- 64 oz. of 52 PICKUP in sufficient water for good distribution per 1,000 sq. ft. of turf area. Grass areas should be washed free of heavy charcoal deposits. Areas where herbicidal effect has been terminated may be seeded within 24 hours of application. For Sprayer Cleaning/Neutralizing: After pesticide use, fill spray tank halfway with water, then add 1/2 gallon of 52 PICKUP per 50 gallons of water. Fill the remainder of spray tank with water and circulate through the system for 10 minutes, and then the nozzles for another 10 minutes. Wash tank well with tank cleaner and rinse thoroughly. Drain system and rinse with clean water until all signs of 52 PICKUP are gone. SpeedZone works great. Easy application. Pestrong provides fast,reliable service and free shipping. Doesn't get much better then that. Thank-you Pestrong. Speedzone is truly the best herbicide I've ever used. I used the recommended 1.5oz to 2oz per gallon of water and sprayed my entire yard 3 days ago and the weeds are all wilting. If you want to get rid of your weeds once and for all this is the product you need. I love this stuff. I have tried every thing to kill weeds on our 1 acre. This stuff did the job easily. Within 2 days could see the results, the weeds were withering. Within a week 90-95% of the dandelions, broadleaf plantain, buckhorn plantain, and white clover were gone. Professional lawn care operator here. Great cool weather product. This was our first season using this particular Speedzone product. I mixed this 50/50 with straight 2-4-D (50 gallon tank - 25 oz. 2-4-D and 25 oz. Speedzone Red) and got great results. Within one week we could already see weeds yellowing and starting to shrivel. Some within just a couple of days. Within two weeks many of the weeds had completely crumbled. Almost all small weeds (less than the size of a quarter) have completely disappeared. Product has virtually no odor. All common weeds like henbit, chickweed, dandelion, etc. started dying almost immediately. Harder weeds like dollarweed, wild violet, woodsorrell, etc. showed signs of dying but required a second stronger application. We used this on all types of grass - bermuda, fescue, zoysia - with a weaker mix for Centipede. Did not use on St. Augustine, which I believe it says not to. We will definitely continue to use this product throughout the winter. Best cool season herbicide available. This product is well worth the cost. Works quickly and completly eliminates weeds. I was suprised at the fast shippihg.